We all know that happy cows make great cheese, so it makes perfect sense that happy chickens make great eggs. That's exactly the premise of the Circular Symbiosis Tower, which is one of the first vertical farm concepts we've seen that is specifically geared towards raising livestock. The livestock vertical farm, designed by Lee Dongjin, Park Jinkyu and Lee Jeongwoo of South Korea for the 2011 eVolo Skyscraper Competition, relies on a symbiotic relationship between the cows, chickens and the green grassy fields in order to sustainably raise healthy animals. 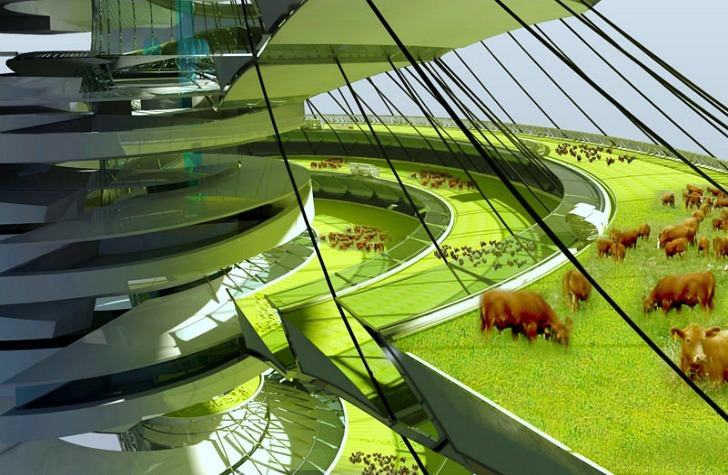 The vertical farm is made up of a continuous spiraling field of grass that spans from the ground floor up to the top. Surrounding this spiraling core are support functions for the farm, a ground floor market, a grouping of residences, a farm-to-table restaurant, as well as a sky lounge. The continuous pasture is terraced to take in more light and some levels are shaded to protect the animals from the heat. Healthy and sustainable operation of the farm relies on the symbiotic relationship between the cows, the chickens and the pasture. First the cows graze on a section of pasture, where they do their thing and leave behind their cow patties before moving on to the next section. Next the chickens move in on their mobile hen house and are released onto the recently grazed patch. The chickens peck and scratch around digging for maggots that have grown in the cows’ dung, which improves the biodegration of the dung and invigorates the pasture, which will soon grown green again. Both the cows and the chickens lead healthy, happy lives free of antibiotics, hormones, and pesticides. And sure, eventually they end up getting slaughtered, but they weren’t raised in a CAFO, and the fresh meat is served up locally at the restaurant and sold in the ground floor market in an urban location. China already has one, and so do we. I don't know where ours is tho. By the time this is popular, cost won't be the question. The question will be, how can we feed more than 7 Billion people. Not just meat. But veggies and fruit as well. look like a great project, what is the cost per acre to make this pasture in the sky? what will be the cost per pound of meat on this farm? Can this farm in the sky pay for itself with meat production or does it need subsidies ? Detroit need this, and China,Japan.Reduce cost of design by selling multiple times. The vertical farm is mostly focuses on the long continuous spiraling field of grass that spans from the ground floor up to the top. The continuous pasture is terraced to take in more light and some levels are shaded to protect the animals from the heat. Surrounding this spiraling core are support functions for the farm, as well as a ground floor market, a grouping of residences, a farm-to-table restaurant, and topped with a sky lounge. Healthy and sustainable operation of the farm relies on the symbiotic relationship between the cows, chickens and the pasture. First the cows graze on a section of pasture, where they do their thing and leave behind their cow patties before moving on to the next section. Next the chickens move in on their mobile hen house and are released on to the recently grazed patch. The chickens peck and scratch around digging for maggots that have grown in the cows dung, which improves the biodegration of the dung and invigorates the pasture, which will soon grown green again. And sure, eventually they end up getting slaughtered, but they weren't raised in a CAFO, and the fresh meat is served up locally at the restaurant and sold in the ground floor market in an urban location. For the eVolo competition, Lee Dongjin, Park Jinkyu and Lee Jeongwoo designed the Circular Symbiosis Tower for the Chicago area, which is big on steak.